a replacement character for the hellpig in single player sauerbraten. I can, and have done much more detailed characters than this, but it was about 16 hrs total work. so not bad time wise. I am as allways open to the possibility of creating characters for a new fps. ooops.. sorry, didn't realize the mesh was missing..
Ok.. final. This was a simple character and I don't want to spend more time on it because I have more to do. So here is the character looking pretty good and functional..
Dude, some of the monster models really need to be re-done. The helpig was one of them until you fixed it up. Man, you should consider re-doing the other monster models and releasing them in a pack. Thats a nice work... really difficult to make playermodels. that's right, there's no *.md5mesh files included in the zip. I keep saying to everyone, node presentation is everything, people only download stuff if they're looking to download something in particular most of the time. I fixed, the zip file sorry about that, I had a few parts I had just corrected and hadn't checked it all. I corrected the zip file in the original post but just in case it doesn't work you can get it here. the model is very very good, but is not correct to work with sauerbraten. it need some little fix to work in. Anyway i would like speak with you by mail, but you have disabled contact. Send me a message if you are interested, i will like use your model in sauer. do you know of the model masks? I suspect the reasons he looks plastic-ish, is because the specmap isn't loaded correctly. or whatever you named the mask. Thanks a lot, the information you gave is invaluable. This was really supposed to be an easy model to test out how to set up the game character. I'll continue to work with it as I work on the next(much more detailed) character. Keep up the crits, and thanks for all the help!! The model itself is very nice :) Just the texturing is a little odd. The diffuse map is strange in that some portions are far too dark (no shading can be seen if it´s too dark) and that it hardly uses it´s pixels, I bet if you scaled it down once, you wouldn´t see any diffrence. I have only theoretical knowledge about normal maps, but aren´t you disallowed to have mirrored parts, at least at the time of the rendering of the normalmap? Looks like that happened here. ya, actually as far as the diffuse goes, I colored it in a hurry. I wanted to just get it done so that I could work out the bugs in the exporter and get it working in the game. There is actually detail that is hidden underneath because it is too dark. I will fix that when I have time. the greenish and red bits are caused by both the limits of the tangent space in the normal mapping in blender, and also by a bug that is yet to be addressed. For the most part it does work though. As for the mirroring a normal map. You have to think of it as being a texture on both sides of a mesh. The colors don't invert just because they are on the other side of the mesh, and since normal maps use color for the mapping it only matters that the layout matches the UV coordinates not which side they are being shown on. hi! fine model, but can U make a stickman player model? qustion: what do you use to make this? I use Blender and Gimp. I'm just back from burningman now and am trying to finnish the new player model I started before I left. Hopefully it will be ready soon.. Absolutely perfect! As others have said, the monster set really needs updating and this style works perfectly. I really hope you make more soon! No license, no source, thus no use to Sauerbraten which has enough problems with non-free content as it is. Please rectify. Also other Free Software projects could use this if you provided the .blend source. charlie: you're not correct. The submission states "Creative Commons (BY)" so the licensing issue is in the clear..
can the designer please include the 'source' (as in .blend or .3ds file) for other editors plz? PS: the monster looks pretty! Ok so that 'link' to a list of CC-by quadropolis content is, in fact, a license tag. That is totally unclear. It should link to the actual license (hey, not everybody is versed in these things) and should have a proper label (like, LICENSE:, or something). Hover your mouse over it? This is classification taxonomy, and is only used to label nodes. Including a correct license or readme is the responsibility of the author, not us. as for the look of it, i do believe it looks exactly as intended. for me, nice detail for a snorting rabid creature. could you share your md5 import tool? 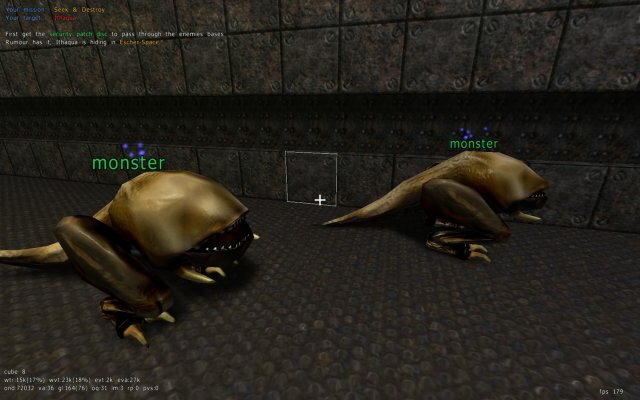 cos the one on doom3world didnt seem to go into my blender although export is there ok.
it is the same just a doferent color not as cool as the one in the picture above why arnt they like that? really good model. this should be in the new release. So...we can create new monsters for SP? Like, something that fly's, for instance? Wow! I'm loving this! Would you be interested in making a Zombie Model for a little project I've got going on? Please email me back at s3ntrydesigns@gmail.com if you are! I could help you out on this. I just need details as to what you would want them to look like them to look like, i.e. arm blown off, bleeding, decayed, etc. email me at retrodude434@yahoo.com to contact me. It must be the "dig-out old nodes and bump them" week.